Click on the site map above for a larger PDF version. Take nothing but pictures, waste nothing but time, leave nothing but footprints. We hope you will enjoy your stay. 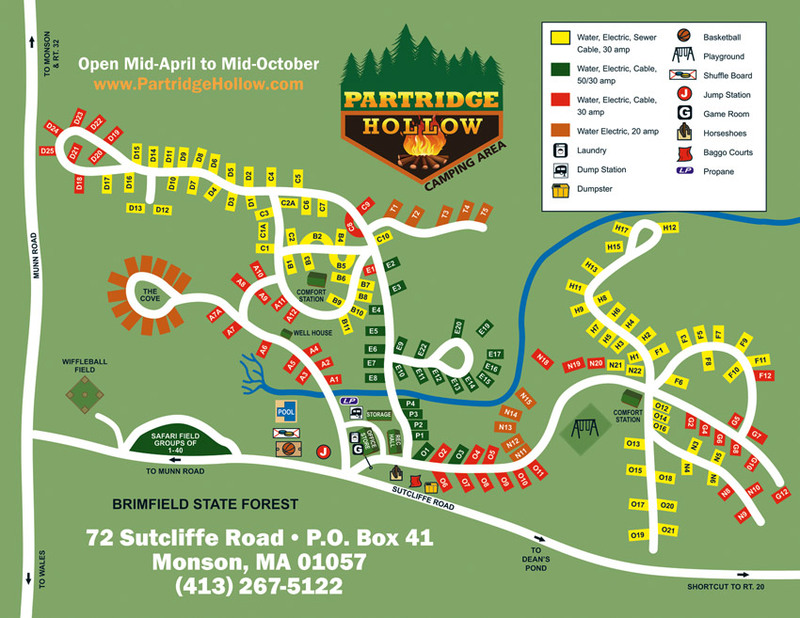 Partridge Hollow is a family oriented campground. Please extend friendship and common courtesy to your fellow campers and join us in a clean, wholesome camping experience. Messages will be posted on the board located near the back door of the office. Only true emergency messages will be delivered during your stay. CHECK-IN - 3:00 P.M. / CHECK-OUT - 2:00 P.M. Early check-in or late check-out if available – nominal fee. Visitors (anyone not registered at the time of check-in) must register at the office before entering the campground. Visitor Hours: 9:00 AM until 10:00 PM. There is a fee. Visitors are not allowed to bring pets into the campground. • Gate cards – all registered campers MUST have a gate card. There is a $10 refundable deposit on the gate card. Cards can be returned during office hours only. Please check for office hours during your stay. • State law requires that we be able to contact anyone on the grounds. Please supply us with names of everyone in your party. • Visitors must register at the office before entering the campground. Visitors hours - 9:00 A.M. until 10:00 P.M. Visitors are not allowed to bring pets into the campground. VISITORS ARE NOT ALLOWED TO CHECK IN AFTER 9:00 P.M. Definition of a visitor is anyone who is not registered with the camping party at check in. • Refund of deposit requires a 7 day cancellation notice, with the exception of Holiday Weekends which require a 2 week cancellation notice. A handling fee of $10 will be deducted. No shows, late arrivals, early departures, less than 7 day cancellation, inclement weather or personal reasons are not entitled to a refund. • QUIET TIME is 11:00 P.M. to 8:00 A.M. All outside radios and televisions must be turned off. Inside ones at low volume. • EMERGENCY or situation that requires assistance after hours, please ring doorbell at office. • NO ATV’s or minibikes allowed on the property. Motorcycles may only be ridden to and from site when entering or exiting the campground. • BICYCLES must be back on site by official sunset time of the day (posted outside the Office). • DO NOT ride bikes, scooters, wagons, etc. in the area of the electronic gate. PLEASE GO AROUND! • FIREARMS or FIREWORKS of any kind are not allowed on our property. This includes BB, pellet, and paintball guns, as well as blow guns and sparklers. • DRONES or any other remote flying devices are not allowed in the campground. • TEMPORARY CLOTHESLINES are permitted. Please remove after each use. • WASHING OF VEHICLES or mechanical work is not permitted on the property. • WE LOVE OUR TREES. NO cutting, no nails, no debarking or other damage. NO chainsaws or log splitters allowed in the campground. Any firewood must be cut and split into 2 foot lengths. Please do not pick up dead trees. Wood is for sale at the store. Wooden pallets or skids are not allowed in the campground for any reason. Restrictions on outside firewood. For more information check out Don’t Move Firewood. • DO NOT MOVE FIREPLACES. DO NOT BURN TRASH (garbage) IN FIREPLACES. • NO DISH WASHING or disposing of trash in the comfort stations. • DISPOSE OF GARBAGE in bags and place in barrels at dumpster area located across from the pavilion. Only everyday trash is permitted. • PLEASE DO NOT DISCARD cigarette filter tips, candy wrappers or other trash on the ground or in toilets. • PARENTS are responsible for their children at all times. Please teach them the rules. Small children must be accompanied by an adult in the restrooms and in the area around the office. Children 20 years and under may not stay at the campground without their parents. • FOR YOUR SAFETY, the playground closes at dusk (official sunset time of the day). • CHILDREN must be on their own site by 10:30 P.M. unless accompanied by parent. • PETS are permitted with permission, if kept on a short leash at all times and come with a copy of their rabies certificate. Maximum of 2 dogs per site. Continuous barking will not be tolerated. Pets cannot be left unattended. Pet litter must be picked up immediately. Children under 18 years of age are not allowed to walk dogs in the campground unless accompanied by an adult. Owners who cannot follow these rules will be asked to remove their pet from the campground. • BE COURTEOUS to your neighbors. DO NOT ride bikes or walk through their sites. • POSSESSION of illegal drugs will be reported to the proper authorities. • DRUG use of any kind is prohibited. • EXCESSIVE DRINKING or DRUNKENNESS, underage drinking, profanity or other offensive behavior will not be tolerated or permitted. Additional rules posted at pool entrance. Please read and familiarize yourself with all pool rules. • Those who cannot abide by the pool rules will be asked to leave. PLEASE do not stand in mulch beds around pool. • The wading pool is for children 6 years of age or under. Parents must be with them at all times. • POOL HOURS — 10:00 A.M. – 8:00 P.M. (closing time will vary depending on sunset hours). • Swim at your own risk. There is no lifeguard on duty. • Bathing suits with built-in ring, life vests, and arm bands are the only floatation devices allowed in pool. No toys, balls, or other devices allowed in pool or pool area. • Swim suits must be worn in pool. NO cut-offs allowed. NO DIAPERS ALLOWED. • Running, rough play, cannonballs, pushing, flipping, running jumps or excessive noise are prohibited in pool and pool area. • Pets, food, cans, glasses, or bottles are NOT permitted inside pool enclosure. WE EXPECT ALL CAMPERS TO ABIDE BY THESE RULES AND RESERVE THE RIGHT TO REMOVE ANYONE VIOLATING THEM OR DESTROYING/DEFACING THE PROPERTY. WE ALSO RESERVE THE RIGHT TO SELECT OUR CLIENTELE AND GUESTS. MANAGEMENT ASSUMES NO RESPONSIBILITY FOR ACCIDENTS, INJURIES OR LOSSES FROM ANY CAUSE TO GUESTS OR VISITORS. OUR POLICIES ARE NOT DESIGNED TO CAUSE INCONVENIENCE BUT TO PROTECT REGISTERED GUESTS AND TO COMPLY WITH INSURANCE REGULATIONS. WE THANK YOU FOR YOUR COOPERATION.